Turns out, a diamond isn't forever - at least, not when it's small. According to a recent trend piece, many wives, unsatisfied with their original engagement rings, are trading them in for something even shinier. 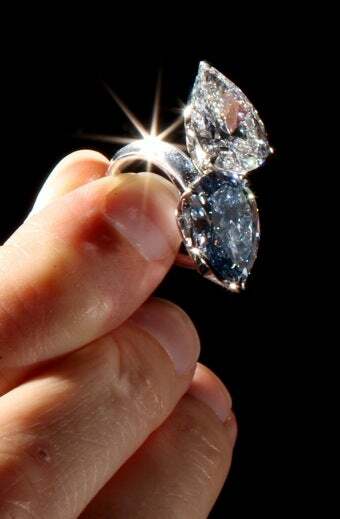 The diamond trade-up, while nothing new, is becoming increasingly popular among a certain set of women. Timing-wise, this seems a little strange — can most people really afford to buy a second ring (and should we really care about those who can?) — but jewelry designer Carol Brodle assures us that it is indeed a "thing." She says trading-up "doesn't necessarily mean bigger, it didn't necessarily mean better — trading up means more about lifestyle." "When I first got my ring, it was like, 'OK, I like this ring.' But I knew that eventually I would make it a different type of ring," she said. "I got a carat-and-a-half pear when I got married, but I always knew I wanted two pears on the side." Other women get "pushing presents" to celebrate the birth of a child. While this seems almost sweet, we can't help but think the kid would be better served having that money funneled into his or her college account. If this sounds slightly judge-y, that is probably because it is difficult not to judge these women. While people are free to do whatever they like with their money, the moment they speak to a reporter about their diamond-purchasing habits, they open themselves up to a certain level of critique. We can't say for certain whether the trade-ups stem from a desire to keep up with the Joneses, or just the magpie-like need for a fancier rock. However, this so-called trend does indicate one thing: the symbolism of the engagement ring has been trumped by its material value (spend enough time in hedge-fund happy NYC, and you'll be increasingly convinced of this). But considering the whole "a diamond is forever" thing was just a marketing ploy designed to sell more jewels, maybe changing things up is how it should be. A diamond, after all, isn't forever. It's for a piece of jewelry — nothing more, nothing less.